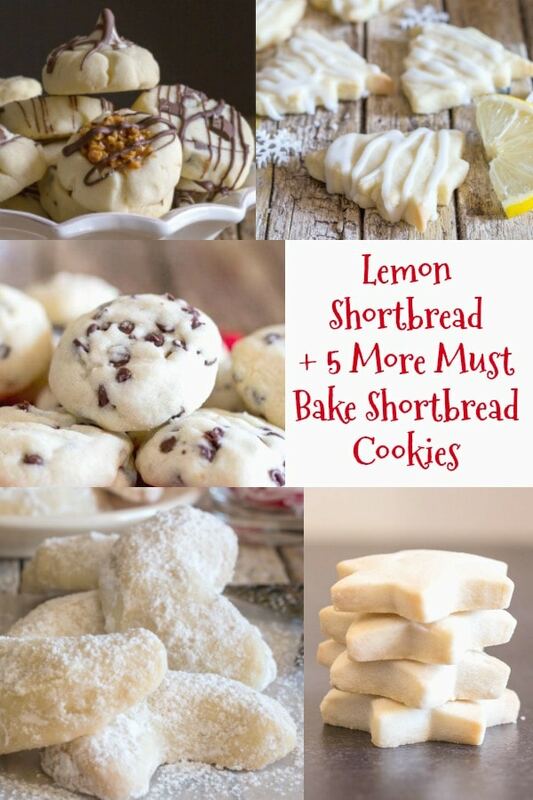 Shortbread Cookies are a must and these Lemon Shortbread are the perfect Lemon Lovers melt in your mouth Cookie. Delicious not just at Holiday Time! I am a huge shortbread cookie lover! Never fail, every holiday season my Mom’s Shortbread Cookies would be front and centre. And for good reason they are amazing.It was always hard to decide what were your favourite, because when you took a bite of one it instantly became your favourite until the next one came along. So of course because of our love of all things Lemon, I knew a Lemon Shortbread Cookie was in our future. 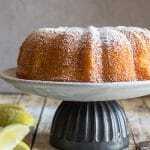 I decided to add an extra touch of Lemon with a simple Lemon Glaze drizzled on top. And yes it was just what they needed! 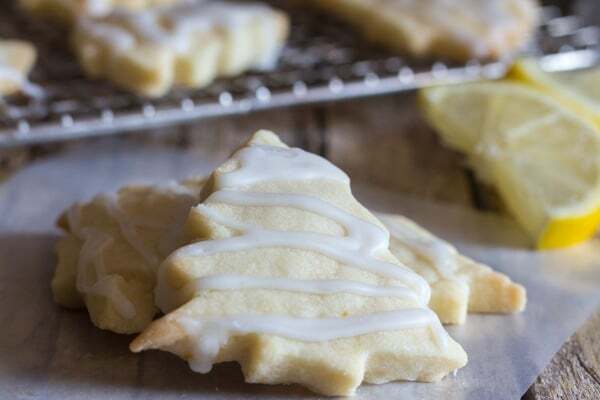 Butter, lemon zest, flour, and powdered / icing / confectioners sugar, and sometimes cornstarch my Mom’s Shortbread uses cornstarch but these Lemon Shortbread do not. Cornstarch is used in some shortbread because it helps to hold the cookie together and make a more tender cookie. 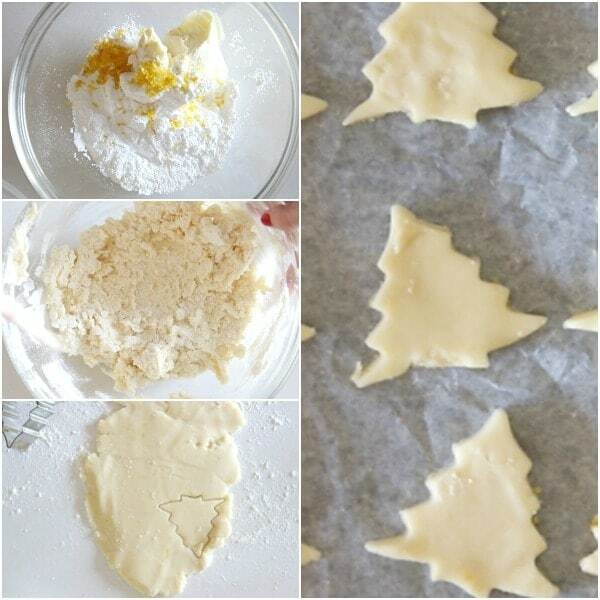 So you see, just a few ingredients to make a delicious melt in your mouth Christmas Cookie. Add the flour slowly, into the creamed butter, sometimes you need less flour and sometimes more. Once it starts to come together move the dough to a flat surface and knead it together, then you can add more flour if needed. If you find that your dough is too crumbly then add a little more butter to bring it together, a tablespoon at a time. These Lemon Shortbread are a one bowl cookie, no beating or creaming necessary. In a large bowl using a wooden spoon mix together the softened butter, powdered sugar and zest until well combined. Then add the sifted flour a little at a time until completely combined. Form into a ball and refrigerate for about 2 hours. Remove the dough from the fridge roll on a lightly floured flat surface and using your favourite cookie cutter cut out forms. The correct way to measure flour is to spoon the flour into the cup measurement and level it off with the blade of a knife. The best flour to use for cut out cookies is a high protein all purpose flour, 12-14 % protein is what you are looking for. Place them on a parchment paper lined cookie sheet, refrigerate for about 15 minutes and bake in a moderate oven for about 12 minutes. 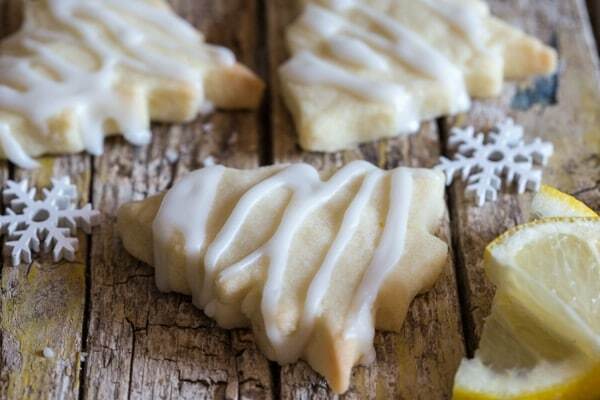 Let the cookies cool completely and then drizzle with a simple Lemon Glaze. 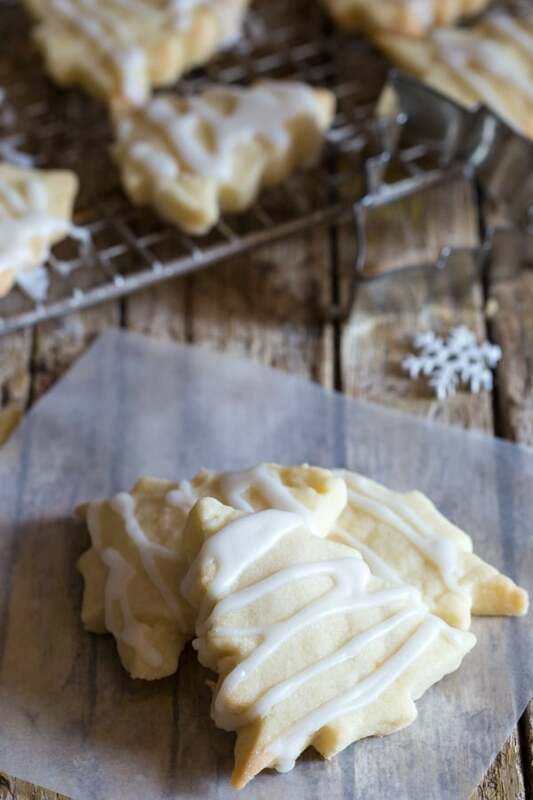 What I love about these Shortbread Cookies are that you can make them anytime in the year. Not just during the holidays. You can use a round, square or any type of cookie cutter or just roll the dough into a log, refrigerate, then slice and bake. Fast and easy and the perfect melt in your mouth Lemon Shortbread. The main reason for chilling the cookie dough before baking is to solidify the fat in the cookies. As the cookies are baking, the chilled fat in the dough will take longer to melt than room temperature dough fat. Therefore the cookies will spread less. There are some delicious Bar Cookies that call for a simple Shortbread Base such as Lemon Cheese Cake Bars or my personal favourites Coconut Jam Squares. All you need are three ingredients, butter, sugar and flour to make the perfect Shortbread base for a Bar Cookie. Christmas wouldn’t be Christmas without shortbread so here are another five recipes that should definitely be on your baking list! Fast, easy and melt in your mouth perfection! 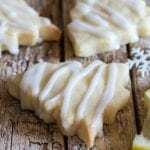 So if Shortbread Cookies are a must on your Holiday Baking List, then I hope you give one or even all of these a try, and let me know how you like them. Enjoy! 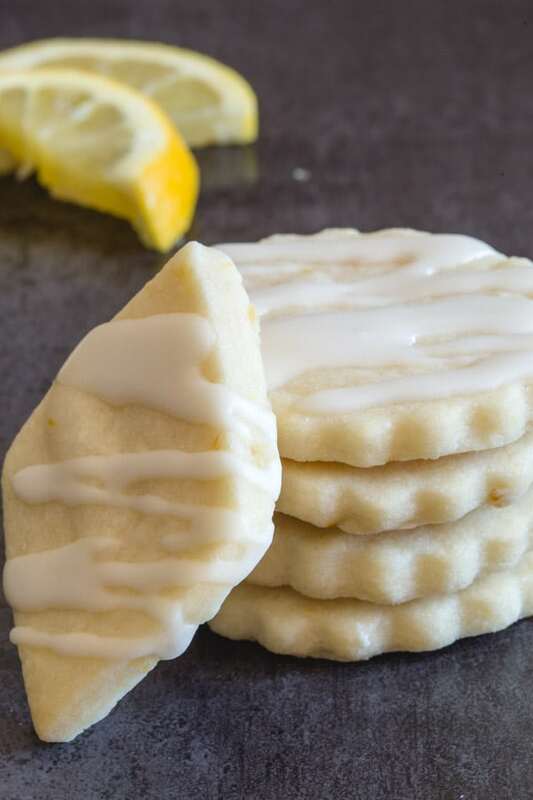 Shortbread Cookies are a must and these Lemon Shortbread are the perfect Lemon Lovers melt in your mouth Cookie. In a large bowl with a wooden spoon mix together the butter, sugar and zest. Add the sifted flour mixture a little at a time, stirring between additions. Once the dough starts to come together (even if you haven't add all the flour), move to a flat surface and knead into a compact ball. (If you need extra flour add one tablespoon at a time, if the dough is too crumbly add more butter, a little at a time). 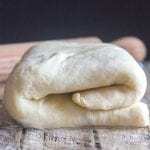 Shape the dough into a ball, wrap in plastic and refrigerate 2 hours. You can also shape the dough into a log or two, refrigerate then slice and bake. On a lightly floured surface roll out the dough to about 1/4 inch thickness and cut out cookies. Place cookies on a parchment paper lined cookie sheet and refrigerate for about 15 minutes. Bake cookies for approximately 12 minutes. Let cool completely before drizzling with glaze. Enjoy. In a small bowl combine powdered sugar, lemon juice and cream, if too thin add more sugar too thick add either more lemon juice or cream. Can you make these with crisco vegetable shortening? So they would be dairy free. Hi Kayla, I have no idea, I have never baked with crisco, you could try and see how it goes. Let me know if you do. I use Earth Balance non dairy spread as a sub for butter. It works pretty well. When you wrote whole/whipping cream, is that heavy cream or could I use regular cream, like for coffee? Thanks! Hi Mila, yes heavy cream, haha I have no idea what coffee cream is. Only one type of cream here. In other words 30% fat or more. Hope that helps. Half and Half cream is what I was referring to😊 I’ll get the heavy cream today! Thank you for replying. Merry Christmas! I have never used lemon zest before. It says zest from one lemon. How much is needed in the cookie? Will I use the entire lemon peel? A tbsp? Tsp? Excited to try these out! Hi Keri, there is usually about 1 tablespoon of zest in one lemon, you have to use a grater to remove the zest. Hope that helps, let me know how you like them. I’m wondering about using doterra lemon oil? Is that possible instead of zest or extract? Thanks Amy, I have never used lemon oil but I’m sure you could. Always make sure the oil is edible, I do believe Doterra is edible. But always confirm. How far in advance can I make this dough? Do I freeze it or just refridgerate if I do make it in advance? Hi Dee, cookie dough will last about 3 or 4 days in the fridge and longer than that it should be frozen. Hope that helps. I subscribed because of this recipe (wonderful!) and because your instructions are on point! I also just spent a half hour browsing! Thanks for so many delicious options, and merry Christmas! Hi rosemary. I made these wonderful cookies, every thing Went well except they lost there tree shape. What went wrong. Hi Beverly, what flour did you use? You need to use a high protein flour 12-14%, hope that helps. Hi Jerri, the reason you let the dough chill is so that the butter solidifies and then it will take longer to bake so that your cookies don’t spread. If it gets too hard let it sit for a few minutes and cut the dough in half and then roll out. Hope that helps. I find that rolling the dough out immediately, to the required thickness, and then refrigerating for 30 minutes is sufficient to allow the butter to solidify enough for cookies to keep their shape. Cuts out the need to chill for 2 hours and then again for 15 minutes. Only one chill session. Take out the rolled sheet of dough, cut out cookies, place on cookie sheet and re-roll the scraps, cut out cookies, until all dough is used. Then bake and enjoy! Absolutely scrumptious! Thank you so much for sharing. Hi Brenda, thanks so glad you enjoyed it. Hi Brenda, thanks so much, yes they were my husband’s favourite too! Have a wonderful Christmas. Just made the cookies. They are amazing! Can I double the recipe? They don’t make a lot and I know everyone is going to love them. Hi Lynne, thanks so glad you like them. And yes you can double the recipe. Have a wonderful Christmas. Can I use lemon extract instead of the zest? Hi Dawn, sure that would work too, I never use extract so I don’t know how strong it is. Maybe 1 teaspoon? Thanks let me know how it goes. Merry Christmas to you also. I just want ed to tell you that I took these to work today and everyone loved them! Thank you again for sharing your recipes. Hi Lynne, thanks so much, so glad everyone liked them. I Hope you have a wonderful Christmas. Made cookies last night OMG so good I cant even tell you. Melt in your mouth. Where can I get the whimsical Christmas cookie cutter? Hi Nancy, thanks so much, so glad you like them. Do you mean the Christmas Tree Cookie cutter? I think that was my Mom’s. sorry. Surely sounds yummy! Wish I had all of the ingredients to make them today! I’m snowed in, and it’s still coming down! Missing ingredients have been added to my list! Just wondering if they are lemony enough with the sugary icing? Hi Jann, I think it all depends on your taste, but they were lemony enough for us. If you want add more zest to the dough. Hope that helps. Can I use this cookie dough in a cookie press? 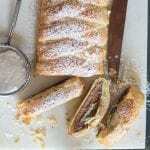 Hi Rosemary, can this recipe and others be easily adapted using gluten free flour for people with celiac disease? Can’t wait to make and try the biscuits. Hi Rosanna, I am sorry I really don’t know because I have never made it gluten free. You could try it and see, if you do let me know how it goes. Have a great week. 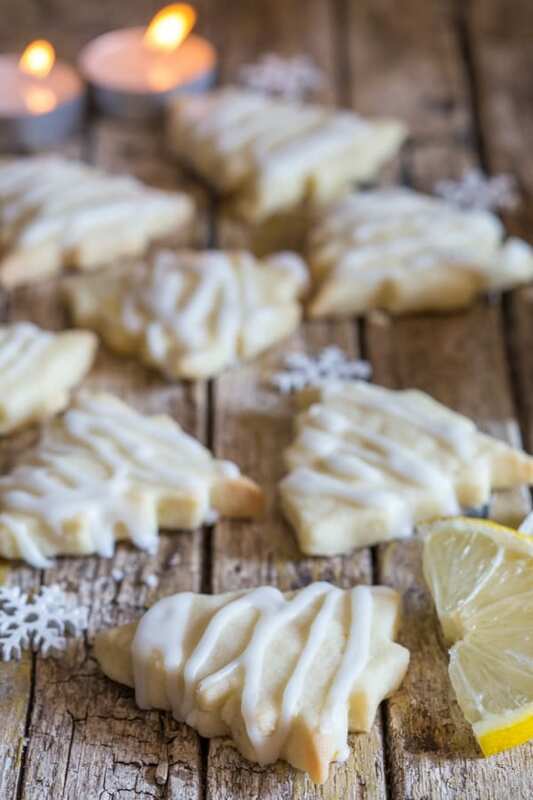 Did you try the lemon shortbread cookies with GF flour? I’d love to try these! Hi Crystal, I have never tried it with GF flour, but if you do let me know how it goes. Hi Nancy, thanks so much and Merry Christmas to you too! Have a great week. Hi Lori, thanks I hope you all enjoy them. Have a great weekend. Hello, I tried out your recipe and I followed the right measurements and directions. But when I tried to bring the dough together, it became extremely crumbly and I kneaded it for a long time but nothing happened and I got frustrated so I decided to give up.. what should I do if this happens again? Hi Dakota, you should add the flour slowly, (depending on how you measure your flour, spoon it into the cup and then level it off with a knife), into the creamed butter, sometimes you need less flour and sometimes more, once it starts to come together move it to a flat surface and knead it together, then you can add more if needed, but in the future if you find this happens again just add a little more butter (a little at a time to bring the dough together. Hope that helps. What kind of flour to use? Plain, self-rising, or even cake. Hi Jeanna, all purpose flour is plain flour, hope that helps. 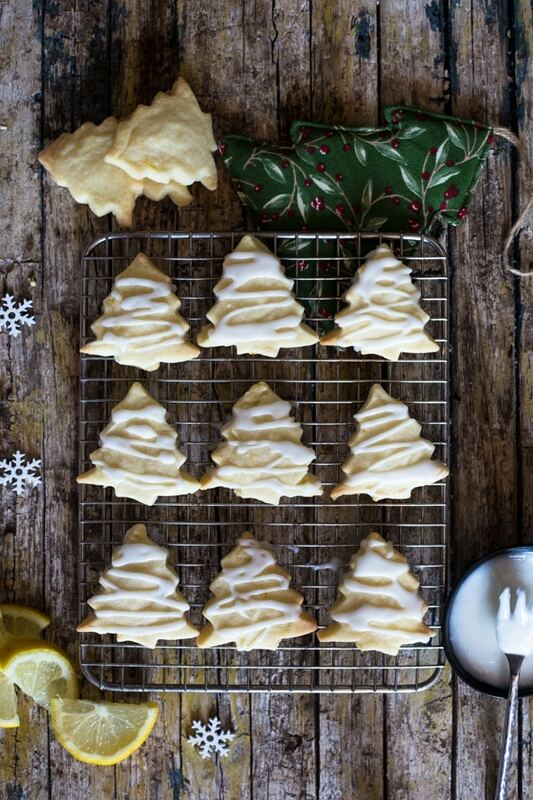 Lemon and shortbread….can’t ask for anything more. I’m drooling. Does the glaze harden enough for the cookies to be stackable? Hi Rachel, the glaze does harden enough in my opinion. Put them in the fridge to get it even harder if you want. Hope that helps. 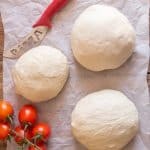 Can I make the dough a day before and leave in the fridge? Hi Sidney, sure that should be no problem. Hope you enjoy them. Should you measure the flour before or after sifting? Hi Katie, measure the flour before sifting. How long will these keep in the fridge? Can the be frozen? If so, how do you recommend wrapping/storing them to avoid freezer burn? Thanks in advance. Hi Kelly, in the fridge they will up to 10 days in the fridge and up to 3 months in the freezer. I think the best way is to layer them in single layers between parchment paper, in an airtight container or freezer bag. Hope that helps. You never say in your ingredient list how much cornstarch? You have it in parentheses but not listed in ingredient list? Why is that? These look fantastic, but am I missing something? I don’t see corn starch in the recipes but it’s mentioned aboce.